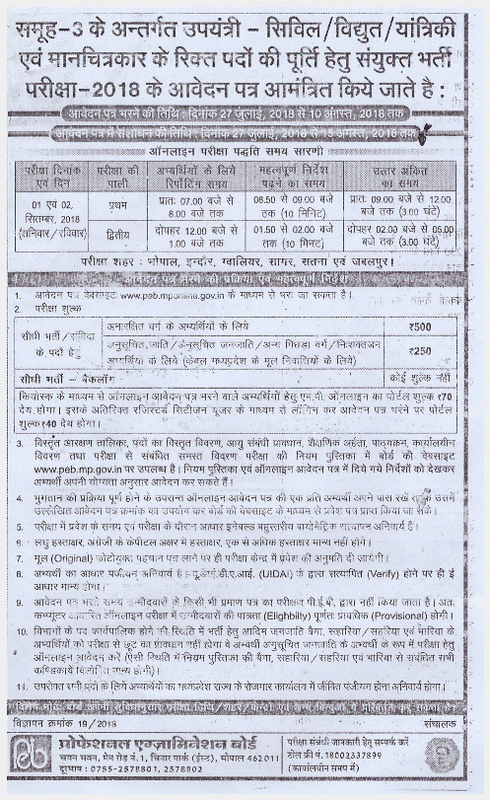 Madhya Pradesh Professional Examination Board MP Vyapam released an advertisement for recruitment of the posts 1021 Sub Engineer by MP Vyapam. Application forms are invited from the Engineering Degree/Diploma in Civil contenders for the 1021 vacancies of Sub Engineer. Application form is available on the website of the organization up to 10-08-2018. While submitting application fee remember to submit it through any MP Vyapam which is computerized, in the State of Madhya Pradesh. No other mode is acceptable. Application form format is attached with the official advertisement. To grab official advertisement you have to go to the official website or click the below given link. Please read further to know more information. Sub Engineer-Civil – 661 posts. Sub Engineer-Electrical – 128 posts. Assistant Draughtsman – 02 posts. Sub Engineer / Investigator / Quantity Surveyor – 01 post. Sub Engineer Electricals & Electronics – 14 posts. Mineral Surveyor – 04 posts. Sub Engineer – Assistant Sub Engineer Civil – 03 posts. Sub Engineer-Mechanical – 22 posts. Selected candidates will get Rs.9300-34800 / – (grade pay 3200 / -) for Sub Engineer Jobs and Rs.5200-20200 / – (grade pay 2100/2400/2800 / -) per month for other posts. from organization.